You travel far and the interventions are long, so you must make your appointments so that your technicians lose as little time as possible on the road. Every day, your call takers arrange an appointment with the individuals and make sure that a technician with the right skills can be present at the appointment. Unfortunately, this is not obvious! Indeed, it is necessary to take into account the appointments already made, the travel time between each point, the time required to carry out the intervention, and of course, the availability of the final customer. The consequence of this last point is that it is not possible for you to choose the time slot that suits you to have optimal tours. Combinatorics is important and the call taker must make a quick decision when he has the customer on the phone. Thanks to smart appointment scheduling, what used to be a puzzle is now the key to your profitability! With intelligent appointment scheduling, you communicate to the Citodi algorithm the location of the intervention, its duration and the authorized technicians. 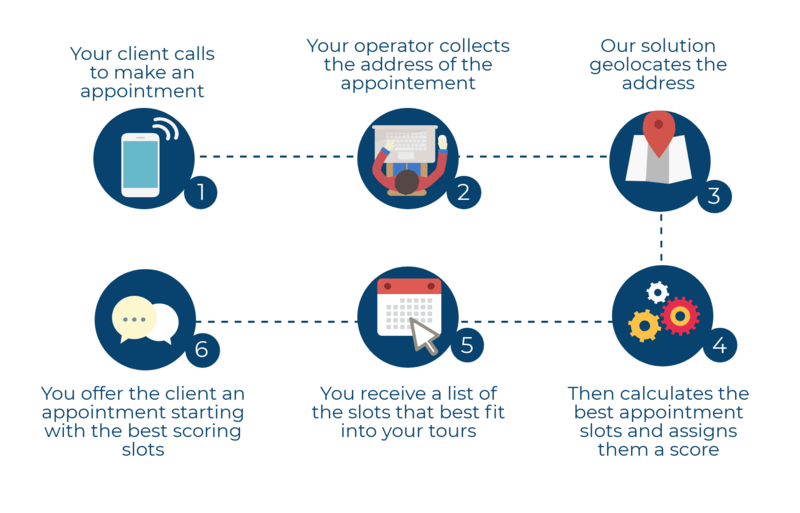 The algorithm instantly returns you a list of all possible appointment slots based on those already scheduled, with a score that indicates the most interesting slots to prioritize for your customer to optimize the tours already scheduled. In this way, the call taker receives in a few seconds an exhaustive list of appointments that he can propose to the customer and suggests the slots starting with those with the highest score. Another possible use of slot calculation with a score is to offer all possible slots directly to the customer (who would make an appointment by internet), with a price that adapts according to the score obtained, in order to adapt the cost of travel to the loss of productivity that this could induce for you. The call taker no longer has to perform any calculations, he is more efficient and can concentrate on the human aspect of making an appointment. The time required to take charge of a new intervention is reduced by 10 to 20% depending on the case. The appointment can be made directly online. The number of interventions performed per day is increased from 5 to 30% depending on the case.